Here is Week 8 for ya! October 29 - Monday: This was the magical day! The day where he was able to nurse without pumping and the whole routine (w/o the shield)! I was honestly starting to think about quitting...getting him to learn how to nurse because we were really running out of options. I was never able to leave the house without an insane amount of work and only for a tiny amount of time. I was also getting no sleep at all. I could write a novel on this whole experience haha! I'm so glad I was stubborn and didn't give up though! I'm so thankful for Kevin who woke up every couple of hours in the middle of the night with me to feed him a bottle while I pumped (and after I did physical therapy and tried nursing 10-20 minutes). I'm also thankful for everyone who came over and helped with him. 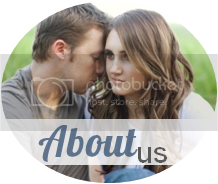 I'm so glad I had an amazing lactation consultant, Becky, because without her I would be clueless and probably would have given up a long time ago and gave him formula! Anyways...that was the highlight of the day! But in the morning, my companion and I visit taught both sisters (church thing) and then at night Kevin and I went to the pumpkin patch with my family. 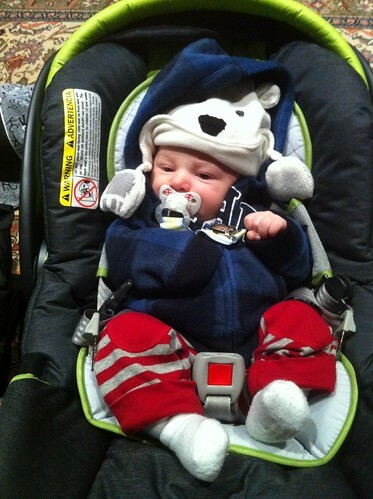 Here is Ryder all bundled up! And Ryder went in the Moby Wrap! 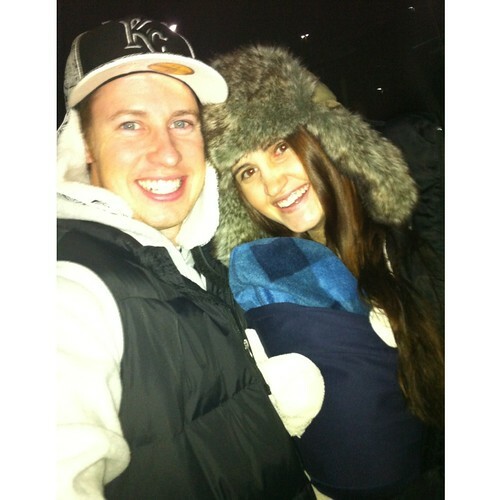 We met up with my family there after they went through the haunted corn maze. They got a few pumpkins and then we decided we didn't want to buy one because we didn't know when we would carve it so...yes we are lame haha! Afterwards we went to my parents for some hot chocolate! 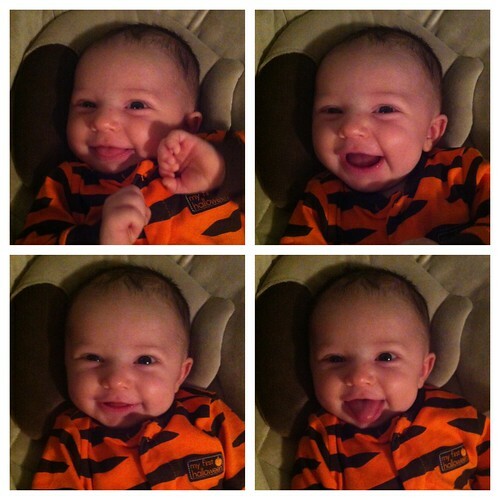 October 30 - Tuesday: Ryder and I went to a super cute Halloween Party at MCR put on by Becky, my lactation consultant. She stayed up super late making cute Halloween treats and foods for all of us girls and our babes. Ryder dressed up as, surprise, a tiger! Haha. I have some photos Becky gave me but I don't think I have permission to put any on the blog since we had to sign release forms to be in them. But, they are cute! November 1 - Thursday: Sooo this day I think I was sick...by the way, I know what happened for these dates because I am obsessed with my planner and usually write down what goes down or what I want to do that day! November 2 - Friday: My mom and I went to lunch at Firehouse Subs. I ran errands and hit up Babies 'R' Us, Target, JCPenney (had a free $10 coupon...love those! ), and Ulta. Running errands with a baby (car seat and putting in and out of shopping carts and random feedings in the car) is a lot harder! Anyways, it was a productive day! I'm pretty sure he had a blowout in this outfit, this day, if I remember right lol. 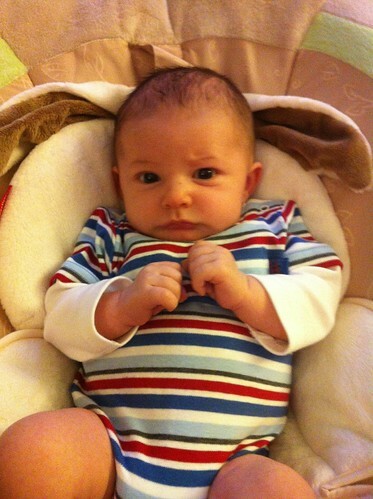 November 3 - Saturday: RYDER turned TWO...2...months old this day! 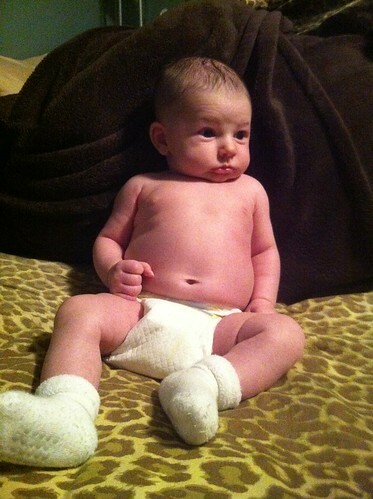 Apparently he chilled in his diaper! November 4 - Sunday: We went to church and it was my first week of doing the ward bulletin (success)! 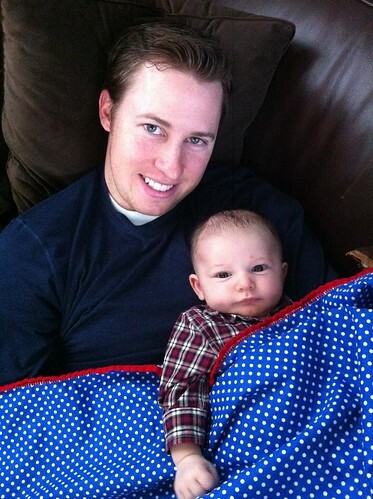 Kevin and Ryder chilling watching some football! In the evening we went to my parents for dinner and Hunter wanted Ryder to try on his glasses. 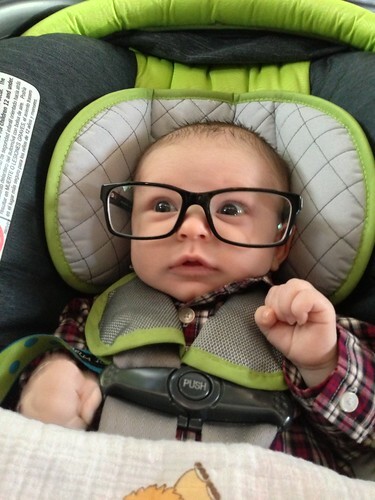 I'd say there is a good chance Ryder gets glasses early. I have the worst vision. I got glasses when I was 2-3 years old, cute, little ones with Mickey Mouse on the side! Anyways, my vision is always changing so I'm not a good candidate for lasik. Plus, I've gotten weird bad eye infections, one of which I could have gone blind. That was the worst eye infection ever!!! Anyways, he may be a little glasses boy! We shall see! 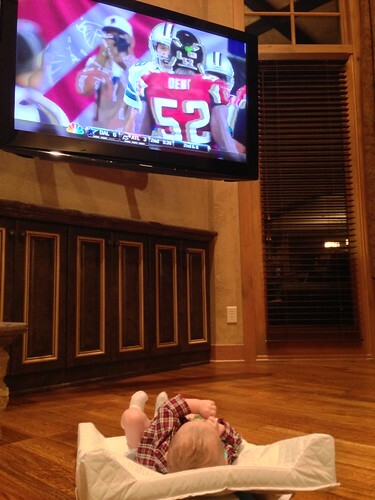 The boys watched football and here is proof Ryder watched a bit. This was a very solid first week where I was able to get out of the house and do things without being a slave to the pump! SO EXCITING! Next up: Week 9, maternity photos, Ryder's baby blessing & weekend...and more!